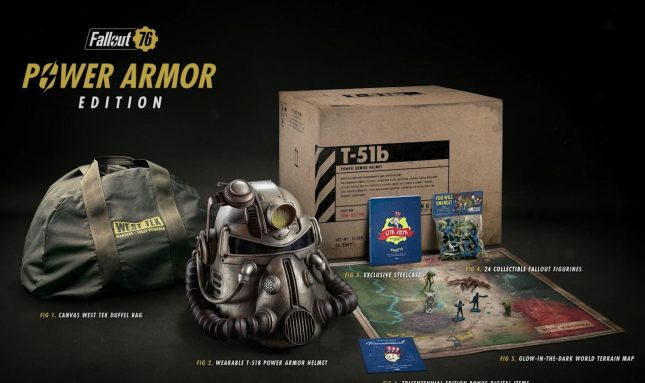 In the image below you can see the special Fallout 76 Power Armor Edition that Bethesda offered. When the game launched and wasn’t that great a lot of these Power Armor Buyers probably regretted spending the money on that special edition game. They regretted spending the money, even more, when the Canvas West Tek Duffel Bag promised when they ordered turned out to be a nylon junk bag when delivered. The canvas bag was meant to hold the wearable T-51B Power Armor helmet. Bethesda tried to apologize to those special edition buyers by giving them 500 atoms, which was in-game currency worth a scant $5. Bethesda has since announced that it is “finalizing manufacturing plans for replacement canvas bags” and noted that buyers of the Power Armor Edition could fill out a ticket by the end of January reports Engadget. There is no ship date offered for the canvas bags at this point. It was very shady for Bethesda to promise canvas bags as part of a special edition costing $200 and then deliver nylon crap to buyers. Then again, Fallout 76 has been hammered with complaints and bad reviews, and so far there are no signs that the game is getting significantly better.